This article will guide you through the steps to use iCinga and set up two different kinds of monitoring configurations. The first is based on simple network checks of your host's external services, such as making a periodic HTTP request to your website. The other configuration uses a software agent running on the host to gather more detailed system information such as load and number of running processes. You should have completed the previous guide How To Install Icinga and Icinga Web on Ubuntu 16.04. This will leave you with the Icinga core and Icinga Web interface running on a single host, which we'll refer to as the icinga-master node throughout. One simple way to monitor a server with Icinga is to set up a regular check of its externally available services. So for a web host, we'd regularly ping the server's IP address and also try to access a web page. This will tell us if the host is up, and if the web server is functioning correctly. Let's set up monitoring for a web server. Pick one of the Apache servers mentioned as a prerequisite and make sure the default Apache placeholder page is being served properly. We will call this server web-1.example.com. We won't need to log into it at all, all the health checks will be configured and executed on the master node. Note: Icinga always defaults to using the Fully Qualified Domain Name (FQDN) of any host it's dealing with. A FQDN is a hostname plus its domain name, so web-1.example.com, for example. If you don't have a proper domain set up for a host, the FQDN will be something like web-1.localdomain. These are fine to use, just be consistent, and if you don't have a "real" FQDN always use the server's IP address in any Icinga address field you configure. This defines a host called web-1.example.com, imports some default host configs from a template called generic-host, points Icinga to the correct IP address, and then defines a few variables that tell Icinga to check for an HTTP response at the root (/) URL and notify the icingaadmins group via email when problems occur. Switch back to the Icinga Web interface in your browser. The interface updates itself fairly rapidly, so you don't need to refresh the page. The new host information should populate in short order, and the health checks will change from Pending to Ok once Icinga gathers enough information. This is a great way to monitor external services on a host, and there are other checks available for SSH servers, SMTP, and so on. But it'd also be nice to know more details about the internal health of the servers we're monitoring. Next, we'll set up monitoring via an Icinga agent, so we can keep an eye on more detailed system information. Icinga provides a mechanism for securely communicating between a master and client node in order to run more extensive remote health checks. Instead of only knowing that our web server is successfully serving pages, we could also monitor CPU load, number of process, disk space and so on. We're going to set up a second server to monitor. We'll call it web-2.example.com. We need to install the Icinga software on the remote machine, run some setup wizards to make the connection, then update some configuration files on the Icinga master node. Note: There are many ways to architect an Icinga installation, complete with multiple tiers of master/satellite/client nodes, high-availability failover, and multiple ways to share configuration details between nodes. We are setting up a simple two tier structure with one master node and multiple client nodes. Further, all configuration will be done on the master node, and our health check commands will be scheduled on the master node and pushed to the clients. The Icinga project calls this setup Top Down Command Endpoint mode. Now we'll switch to the client node, install Icinga and run the same wizard. The command will output a key. Copy it to your clipboard, then switch back to the client node, paste it in and hit ENTER to continue with the wizard. information/cli: Requesting certificate with ticket '5f53864a504a1c42ad69faa930bffa3a12600546'. It might take a moment for the connection to be made. Eventually netstat will output a line showing an ESTABLISHED connection on the correct port. This shows that our servers have connected and we’re ready to configure the client checks. Even though the master and client are now connected, there's still some setup to do on the master to enable monitoring. We need to set up a new host file. Switch back to the master node. One important level of organization in an Icinga install is the concept of a zone. All client nodes must create their own zone, and report to a parent zone, in this case our master node. By default our master node's zone is named after its FQDN. We'll make a directory named after our master zone within Icinga's zones.d directory. This will hold the information for all the master zone's clients. This defines two service checks. The first will report on the CPU load, and the second will check the number of processes on the server. The last two lines of each service definition are important. command_endpoint tells Icinga that this service check needs to be sent to a remote command endpoint. The assign where line automatically assigns the service check to any host that has a client_endpoint variable defined. This file defines a zone for our remote host, and ties it back to the parent zone. It also defines the host as an endpoint, and then defines the host itself, importing some default rules from the generic-host template. It also sets some vars to create an HTTP check and enable email notifications. Note that because this host has vars.client_endpoint = name defined, it will also be assigned the service checks we just defined in services.conf. Switch back to the Icinga Web interface, and the new host will show up with checks Pending. After a few moments, those checks should turn Ok. This means our client node is successfully running checks for the master node. 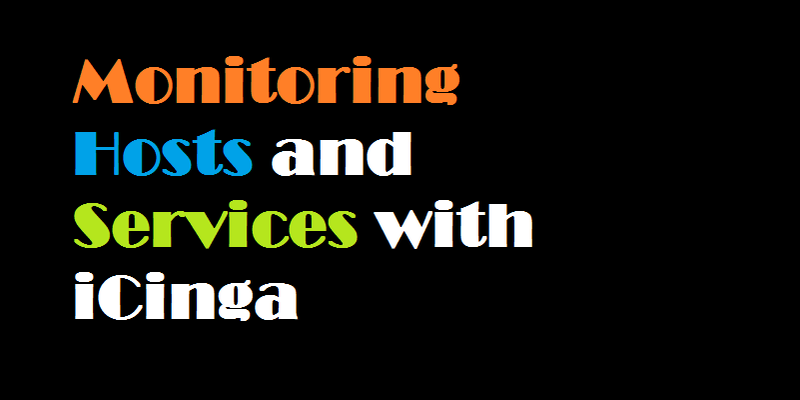 In this guide we set up two different types of monitoring with Icinga, external service checks and agent-based host checks.